It's hard to believe that in two short days, the month of September will be upon us. It seems as though the summer flew by, and all of a sudden the sun is rising later and setting earlier, there is a cool bite in the air at night, and leaves are starting to cover the ground. Crazy! This week, we filled the store with several decidedly fall-themed table settings, but this one vibrant, summery setting still remains. It seemed only fitting to share this week, before we're plunged into the season of pumpkins and apples and spiced cider and warm sweaters. The real zest here is the Libeco Home Polylin Tablerunner in Verde. The bold, rich green color really sets a tone for the table, and provides a colorful and lively backdrop for the rest of the more subdued setting. The table has a very strong mix-and-match feel, but somehow all of the pieces fit to create a harmonious look. Each individual setting is comprised of three dinnerware pieces, the iittala Sarjaton Dinner Plate in Metsa/White, followed by the Jars Ceramics Tourron Dessert Plate in Jade and topped off with the iittala Sarjaton Bowl in Letti/Pearl Gray. This is all set atop a Chilewich Kono Square Placemat in Fog with David Mellor Embassy Flatware. To the side of each setting, we placed an Alessi Colombina Teacup and Saucer. 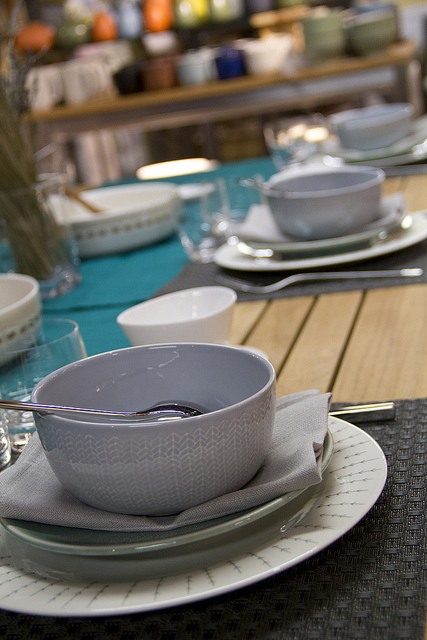 As additions to the table, we used a few more Alessi pieces, including the Alessi Ovale Little Plate and the Alessi Ovale Saucer, alongside an iittala Sarjaton Serving Bowl in Tikki. To finish it off, we placed a Simon Pearce Woodbury Petite Vase in the center of the table, filled with dried lavender. However you spend your last fleeting moments of summer, I hope you enjoy them. We'll look forward to sharing some more saturated earth tones and flavors of fall after the labor day holiday!